The following is a sample of observations many of the DCRP Master’s students had during their spring break. We curated a sample from students who stayed around the Triangle to those who traveled internationally. I went to the transit museum in Brooklyn and learned about the history of New York’s subway system. There was a special exhibit on the construction of the new Second Avenue Subway (this exhibit pic is of 86th Street escalator tunnel) and it was fascinating to see how construction methods and working conditions have changed from the time the first subways were built in the 1900s. Also a few things that haven’t changed: the tunnel boring crew is still part of the Sandhogs union and many of the people who are building the Second Avenue Subway are part of a lineage of Sandhog men going back 3-4 generations. Over spring break, with my nearly-developed planner’s lens focused, I picked up on the evidence of poor planning policy in the narrative tradition of Black forms of music. This evidence is obvious in the US. Descriptions of failed housing, economic, and social policy and can be found from soul music of the 1970’s through current hip-hop music. This tradition is not only found in the US, but throughout the African Diaspora. My conclusion was that it’s better to dance your way through processing external maladies. The Temptations “Ball of Confusion” sprang this thought. I was in Mexico City, Mexico, during the break. 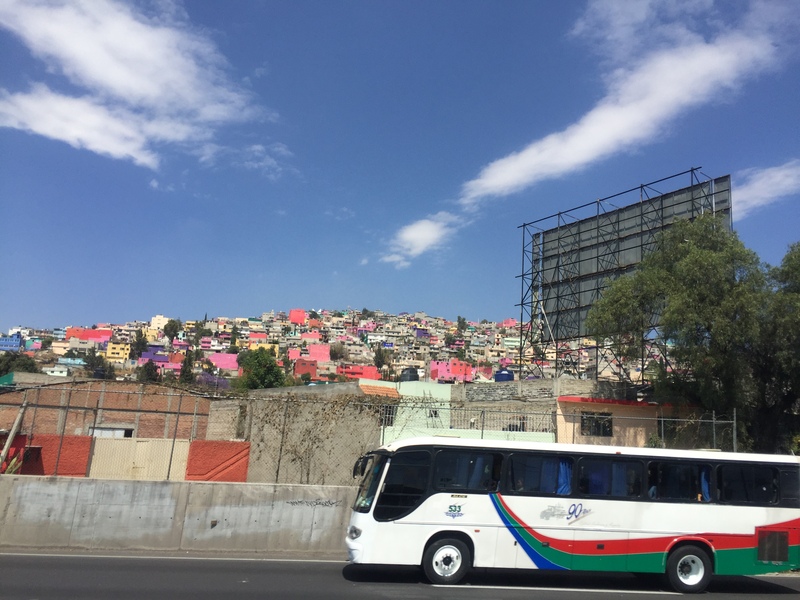 This photo is a view from the bus that travels from D.F. [Distrito Federal – AKA Mexico City] towards Teotihuacan. In Teotihuacan, the city developed multi-family housing units, which was extremely unique for its time. They had over 2,000 ‘apartment buildings’ that were relatively large and luxurious compared to ‘commoner’ housing in other parts of the world. Click here to read more about it. A picture of my brother and me standing underneath an external fuel tank that was used during testing for the Space Shuttle in the late 1970s. In 2013, it was on its way from the Kennedy Space Center to a museum exhibit near Cape Canaveral. It comfortably completed the first leg of its trip on-board a cargo ship in the Atlantic Ocean, but things went off course upon its arrival at the Green Cove Springs port. Officials suddenly realized they would need to shut down several highways and create adequate clearance in order for the fuel tank to finish its journey – something they apparently overlooked when planning the trip. It has been sitting at the old naval base for the last four years, dreaming of outer space and a chance to complete its terrestrial expedition. I visited Havana, Cuba, and learned about the ‘machina’ system. The machina taxi system is a ride-share system frequently used by the Cuban people, which employs the use of classic 1950s American cars. It provides residents with affordable transportation services (about 50 cents per ride within the Havana city limits) while providing flexible employment opportunities. For the break, I wanted to escape the small town life by immersing myself in one of the biggest and arguably most beautiful cities in the U.S.: Los Angeles. I say arguably because I was surprised by L.A.’s natural offerings. We usually hear about the city of Angels as a sprawling mess full of traffic and vapidly beautiful people, but we don’t often see or hear about the wonderful urban escapades the city offers. In under an hour–luckily I avoided major traffic–you can overlook the city up on the hills, lose yourself in the pacific ocean, or check out one of the national parks surrounding the metro area. This trip helped me understand why so many people seem so happy in LA. [Note: as far as affordability, equity, natural hazards, and pollution is concerned, I can’t speak for the area]. This is a photo taken in jest of Pasan Perera lying supine on a country road on the Albemarle-Pamlico Peninsula in eastern, NC. We were stranded for about 30 minutes after getting our rental car stuck in the mud when looking to make a u-turn. There was nothing we could do as pedestrians but wait for our rescue.